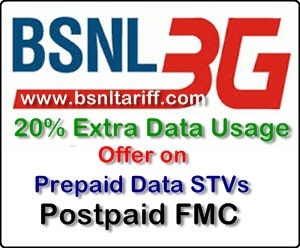 Leading Public Sector Unit Bharat Sanchar Nigam Limtied (BSNL) launched special 20% Extra Data usage Speical Tariff Vouchers offer for 3G Prepaid Fixed Monthly Charges (FMC) for 3G Postpaid Mobile Services. The BSNL Competent Authority of Maharashtra and Goa Telecom Circles started 20% Extra 3G Data usage offers on Rs.250, Rs.Rs.450, Rs.601 and Rs.750 under Prepaid Services and for Fixed Monthly Charges Rs.220, s.400, Rs.540, and Rs.670 under Postpaid Mobile Services for limited period of time on promotional basis. Currently customers are availing 1000MB Free Data usage on Recharge of Rs.250/- Now, under promotional Bundled Free data usage offers 1200MB with validity for 30 days. Currently customers are availing 2000MB Free Data usage on Recharge of Rs.450/- Now, under promotional Bundled Free data usage offers 2400MB with validity for 30 days. Currently customers are availing 3000MB Free Data usage on Recharge of Rs.601/- Now, under promotional Bundled Free data usage offers 3600MB with validity for 90 days. Currently customers are availing 5000MB Free Data usage on Recharge of Rs.750/- Now, under promotional Bundled Free data usage offers 6000MB with validity for 30 days. Currently customers are availing 1000MB Free Data usage on FMC of Rs.250/- Now, under promotional Bundled Free data usage offers 1200MB. Currently customers are availing 2000MB Free Data usage on FMC of Rs.400/- Now, under promotional Bundled Free data usage offers 2400MB. Currently customers are availing 3000MB Free Data usage on FMC of Rs.540/- Now, under promotional Bundled Free data usage offers 3600MB. Currently customers are availing 5000MB Free Data usage on FMC of Rs.670/- Now, under promotional Bundled Free data usage offers 6000MB. The above offer will be available upto 5th October, 2013. All other terms and condtions will remain the same.